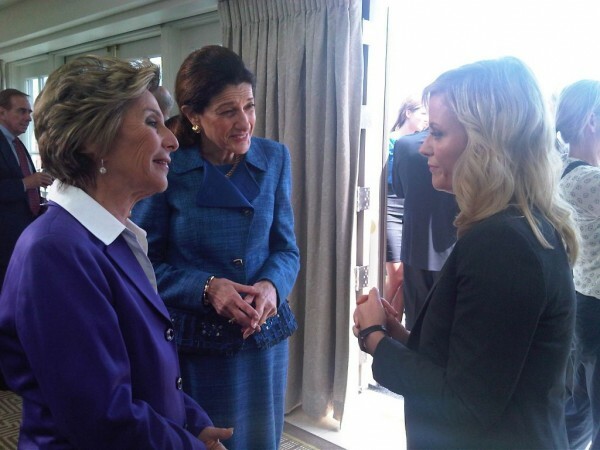 Sen. Olympia Snowe, R-Maine, speaks with Sen. Barbara Boxer, D-Calif., and "Parks and Recreation" star Amy Poehler after shooting a scene for the NBC comedy on Thursday, July 19, 2012. WASHINGTON, D.C. — U.S. Sen. Olympia Snowe spoke two lines in a cameo appearance on NBC’s “Parks and Recreation” that was shot Thursday on location in the nation’s capital and involved two other Senators, Snowe’s press secretary Brandon Bouchard confirmed. “The episode is basically about the main character, Leslie Knope (Poehler), who has just been elected, traveling to Washington D.C. to visit her boyfriend, Ben Wyatt (Adam Scott), who invites her to a cocktail party” where Snowe and fellow Senators Barbara Boxer, D-Calif., and John McCain, R-Ariz., are in attendance as themselves. The episode is scheduled to be broadcast on Sept. 27. “Sen. McCain is in a different scene but also will be in the episode,” Bouchard said. Knope is “a mid-level bureaucrat in the Parks and Recreation Department of Pawnee, Indiana, and her tireless efforts [are designed] to make her quintessentially American town just a little bit more fun,” a press release from the show about the Senator’s cameos states. Snowe has a couple lines in the episode, but Bouchard wasn’t about to give away any spoilers. “You’re going to have to wait, just like the rest of us,” her press secretary said. “Parks and Recreation” debuted on April 9, 2009 and the comedy show is now shooting its fifth season. Over the years, the show has been nominated for an Emmy Award for Outstanding Comedy Series and Poehler has two Emmy nominations. The show’s producers recently contacted Snowe about doing the cameo, which is part of the upcoming season’s second episode, Bouchard said. In addition to Snowe, “a couple other Mainers will have some cameos,” said Bouchard, who is one of the silent extras along with Snowe’s chief of staff John Richter, communications director Chris Averill, scheduler Lauren Spivey, and deputy press secretary Scott Ogden, from Monmouth. “I’m from Caribou so The County was represented,” Bouchard said.